Big news from Valve regarding a revamping of the current approach and introduction of a new system and format for the competitive scene. Valve will be sponsoring, in partnership with third party organizers, three additional “marquee” events to take place quarterly, with The Internationals being the pinnacle of all the events. The Dota Major Championships, starting this Fall, will be an annual series of four marquee tournaments, one being The International. The three additional tournaments will be Valve-sponsored events hosted by third-party organizers at different locations around the world. Although the release could be summarized to Dota Majors now a certainty, Valve made it clear that there was a need for changes and improvements. This was including more structure, stability and regulation. The communication comes during an unstable and volatile period in the Dota 2 scene with tournament saturation and inconsistencies, constant team reshuffles and instability, and general chaos and controversy with teams scrambling to find the advantage and upper hand strategies to secure a place at The Internationals. It’s a clear indication that Valve is listening and aware of both the current status and the impact of these issues on the future state of the game. Valve had maintained a relatively hands off approach to the competitive scene until now, allowing for a free market to take root. It left the community to regulate and run its own events, often at detrimental and dangerous costs as explored in more depth earlier this month. The community outcry over the developing course included twitter rants, blogs, interviews, panel discussions, articles, and most recently players meeting with Valve to discuss the implications and results of the offhand approach and the need for some degree of structure, expectations, regulation and standardization. Yaroslav “NS” Kuznetsov post inspired Toby “Tobiwan” Dawson to write the dangers to the future of Dota 2. Professional Dota community must do something about it quickly, if it doesn’t want to end up in a situation where even the biggest Dota tournament would have less viewers than a dozen of simple League of Legends Let’s Plays, although it is almost in that situation already. Upon immediate glance, the positive sides to this change is that by Valve’s involvement the three other major tournaments will create an establishment and standardization across the major events in rules and expectations. The chaos that is created by inconsistent rules or criteria for qualifications leads teams to cut corners or find advantages to exploit to gain favorable positions. Four events at different locations around the world and at set intervals will also take out the uncertainty and apprehension that occurs each year leading up to The Internationals with teams and players being forced to make decisions based on invite speculation regardless of the impact it might be having on the team or player. The quarterly format will provide structure to the year, making it easy and fun for casual fans to follow and still be informed about. This is much like the tennis circuit model referred to and suggested by Duncan “Thooorin” Shields, esports historian, discussed. While in his example it was aimed at the possibility of adopting a point circuit system as an alternative to determine player and tournament worth, he still highlights the importance for fans and players to be able to have benchmark points of reference in their performance and status. The fact that the events will be in partnership with third party organizers indicates that the production value will be improved and kept at a higher standard, as well as creating a certain amount of accountability from the tournament organizers. While there were no additional details about other tournaments, it implies that other events are still encouraged and supported, allowing for smaller events and organizations in the community to still do their own thing without Valve’s interference. According to Alan “Nahaz” Bester, Greg “whatishiptv” Laird and Steve “Toffees” Pierce during a recent show the incentives to deliver value now setup up the game production and for those event organizations that are not part of the majors, they will have to deliver something to make them stand out and set their event apart from the others. The statement included a reference to the roster stability or lack of and indicated that “Teams that participate in these events will be required to adhere to limited roster trade periods during the year.” The limited roster trade periods reflects that of trade window time frames and will address the everchanging, neverending roster changes and shuffles that continue to promote instability, player poaching, lack of commitment by teams, players and organizations and will promote and encourage a greater team strength as they will have to find ways to work through differences and overcome barriers. Which four organizations will be given the honor and the chance to hold a major event? One logical choice appears to be Perfect World, the organization that hosted and produced Dota 2 Asian Championships. It was successful and was regarded as the “Asian International” or the “International of the East”. The tournament was alike in the quality of the teams directly invited and of those invited to the qualifiers, the format of the tournament, the release of a compendium, the size of the total prize pool reached by the sale of compendiums together with the initial prize pool. The tournament had a total prize pool of over $3,000,000. DreamHack, StarLadder, MLG and ESL are the top organizations considered as having the best chances of acquiring Valve’s approval for a Major. It seems obvious that The International would be held in North America, and most believe China and Europe would be given events to host, but the last region remains in question. Would Valve allow for more than one region to host a tournament in the year such as The International and then MLG? CIS region is an area that could host one, although with recent move from StarLadder from Kiev to Romania, allows room for some question if CIS would be a smart move and to the second question of if an organization would be able to hold an event outside their own region. South Korea has the proper systems in place to support the tournaments, but Dota 2 is not very popular there. Overall the reaction from the community has been positive. From pro players, to casters, to Dota 2 personalities and fans, most are in agreement that this is a positive answer and step in the right direction. Jacky “Eternal Envy” Mao had stated in an interview this last weekend in Bucharest Romania at StarSeries Season XII that he thought it was a positive thing and supported the idea as long as it was fair and each region didn’t get to be top heavy in team participation from their region. Wow! Hao decision about not retiring after todays VALVE announcement is awesome! The changes will be in effect for the fall event and as that time approaches more details will be announced. This essentially means that post The International 5 will unfold very differently for teams and players and will mark end of an era. 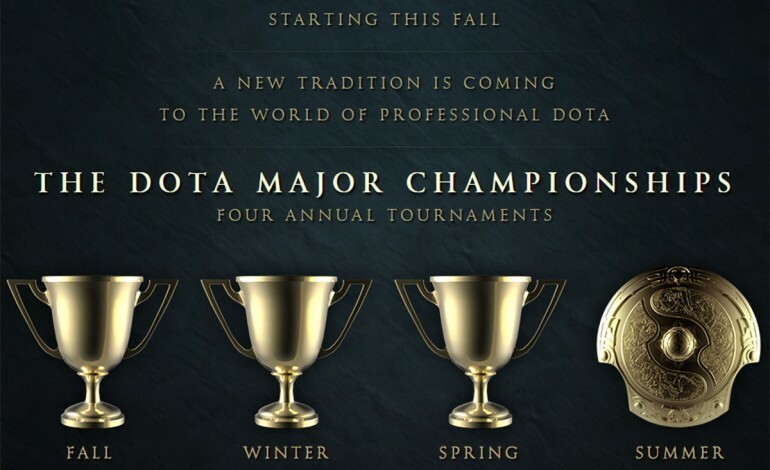 The International is the annual Dota 2 tournament hosted by Valve Corporation. The International made its debut in August 2011, with a total prize pool of $1.6 million.The event will take place at the KeyArena, a multi-purpose arena in Seattle, Washington, with a maximum capacity of over 17,000. Last year, the Dota 2 community contributed with a staggering $9,331,105 to the 1.6 million base prize pool, making the total prize pool of almost $11 million the largest in eSports history.